From the cannabis party to candidates dressed as naked cowboys on election posters, election time in Denmark is always a source of much amusement and endless debate for the locals. But to many outsiders, it’s a time of trivialities and of little consequence. Sure, it’s impossible to miss the tsunami of election posters going up all over the country, and who doesn’t crack a smile at a naked sheriff, but there is little effort to include the growing number of internationals living and working in Denmark. But here ye, here ye! All that changes now. It’s time for the European voice to make itself heard. With the local elections swiftly approaching later this year, Keith Gray – a publisher by day and political petitioner by night – has stepped into the breach. A native of the Shetland Islands, Gray will be on the ballot as a candidate for Socialdemokratiet on election night on November 21, and having lived in Denmark for more than a decade, Gray is acutely aware that the thousands of non-Danish EU citizens calling Copenhagen their home are yearning for representation. The issue was compounded by the Brexit vote last summer as 3,500 British citizens, according to Gray, who face losing the right to live in Copenhagen. But he’ll have his work cut our for him, because despite local elections being the only time non-Danes can vote in Denmark, aside from EU elections, most EU citizens don’t bother voting. During the last local elections in 2013, only around 30 percent of EU citizens in Copenhagen voted, compared to about 70 percent of Danes. Gray aims to galvanise the European voters, and that’s no easy feat, considering many are only in Denmark temporarily. But Gray hopes to convince people that voting is essential as the municipal decisions impact daily lives – from kids in daycare and the rubbish being emptied to keeping the public transport running smoothly. “They might not be that interested in long-term projects if they know they’ll be leaving in two to three years, but you never know what the future will bring,” said Gray. The good news for Gray is that there are more and more internationals in the country. Recent figures revealed that a record 336,840 international people worked in Denmark in 2016 – a 45 percent increase from 2008. According to figures from Danmarks Statistik, there are some 44,000 EU citizens living in Copenhagen Municipality – so that’s not including Frederiksberg, Gentofte etc – out of a total of 600,000 people in Copenhagen. But Gray is more than a one-trick Shetland pony bent on bucking for EU issues. In fact he’s on the gallop for plenty of other more local-orientated issues. He is a keen supporter of reducing pollution in the city and facilitating that by improving public transport and working to ensure that the municipality uses electric cars and buses to lead the way. Another issue that lies close to Gray’s heart are the continuous cuts in municipal funding for public libraries. Another key issue is ensuring that Copenhagen remains a city that everyone can afford to live in. Figures from 2013 showed that the number of city dwellers in the capital who earn over 400,000 kroner a year has almost tripled from 7 percent in 2000 to 20 percent in 2011. Gray first got involved in politics as a member of the Labour Party in the UK at the age of 17, and he kept that drive going when he settled in Copenhagen all those years ago. 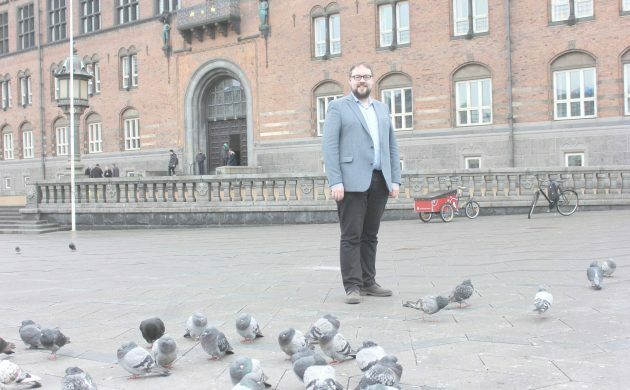 When the Østerbro chapter of the Socialdemokratiet party were looking to field seven candidates ahead of the 2017 local elections, Gray found himself standing up to be counted. “They wanted our list to represent Copenhagen, so there should be 50 percent women and people of non-Western background, and while no-one said anything about European immigrants, the first thing I thought at the time was that Copenhagen had never had an EU immigrant on the municipality,” he said. You won’t be seeing any posters of Gray dressed up as a naked cowboy as the election campaign gathers momentum this autumn, but there’s a good chance you’ll run into him around town as he goes door to door trying to get the word out. Internationals are an integral part of this city and they have a voice, he will say. Now is the time to put it to good use. “European citizens are everywhere: from the local baker and the municipal worker to the publisher in Holte,” said Gray.